There was a boarded-up and cement-blocked old fireplace in the kitchen – the wall painted white with some old bead-board trim around the edges. And then there were floor vents and duct work that had been hobbled together as part of the project to flip this house. Some of the vents were connected to nothing, ducts went nowhere and the whole mess of it was demolished. So out of all these heating options – we were left with nothing but a clean slate. 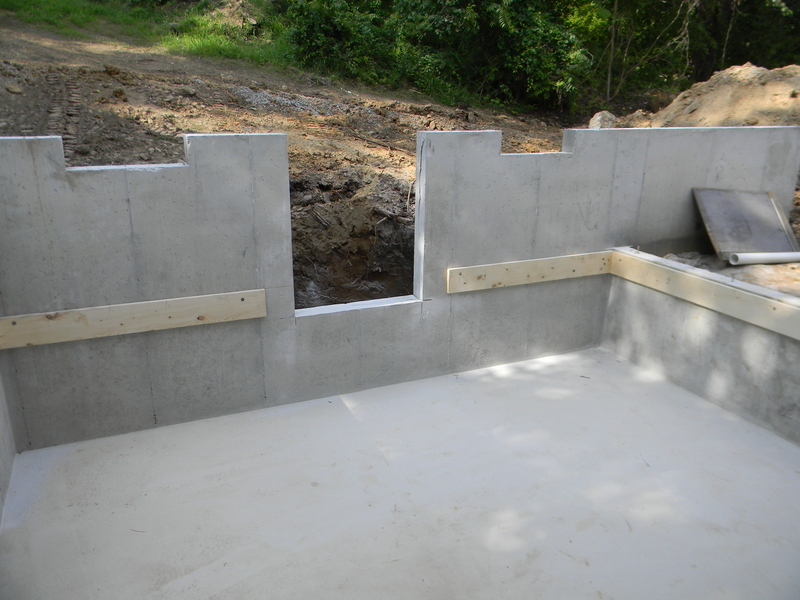 The builder is installing a three-zone heating and cooling system with well hidden duct work that doesn’t interfere with the character of the house. So I expect that we will be comfortable – but comfortable and aesthetics are two different things. 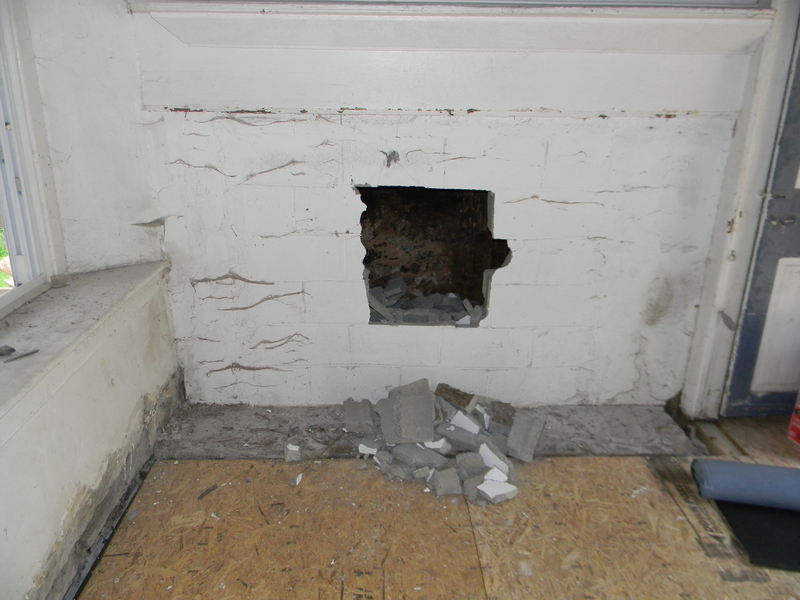 I wanted to open the fireplace in the kitchen, but after further inspection, it appeared that the original chimney had been removed, the new roof built over top, and the chimney capped off inside the attic. 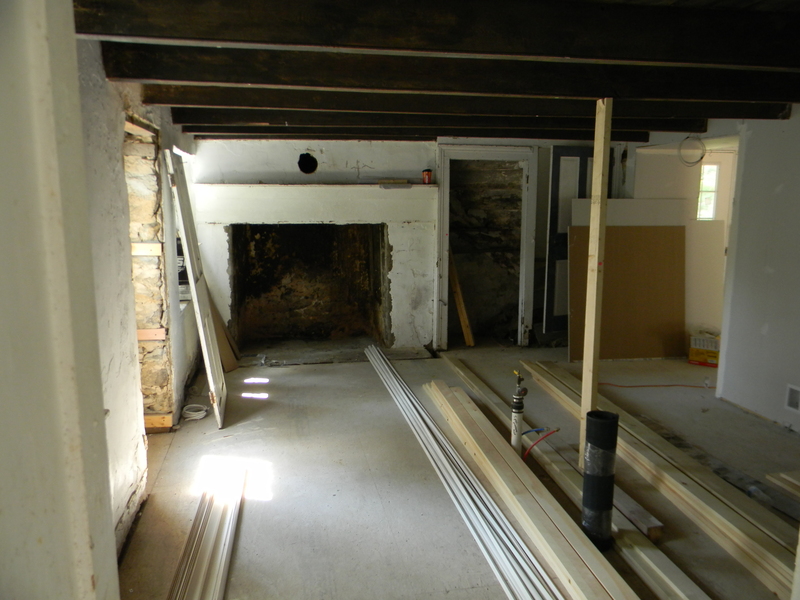 With the fireplace covered in cement blocks, it was difficult to make an easy determination about the condition of the 163-year-old structure and John, our builder, advised against it – given the scope of the entire project – which seemed quite overwhelming. Besides, a brand new fireplace would be easier to manage, could be easily built in the new addition and wouldn’t yield any unexpected surprises. We agreed. But then we disagreed. Chris wanted a wood burning fireplace. I’ve been spoiled by the gas fireplace that you can light with one finger and the flip of a switch. It’s so easy, in fact, that even Arianna knew to point to the switch and wait to be picked up so she could flip it off and on before she was even two years old – it’s that easy. But, since Chris agreed to cut the wood, split the wood, haul the wood, light the fire and clean away the ashes – what could I say? 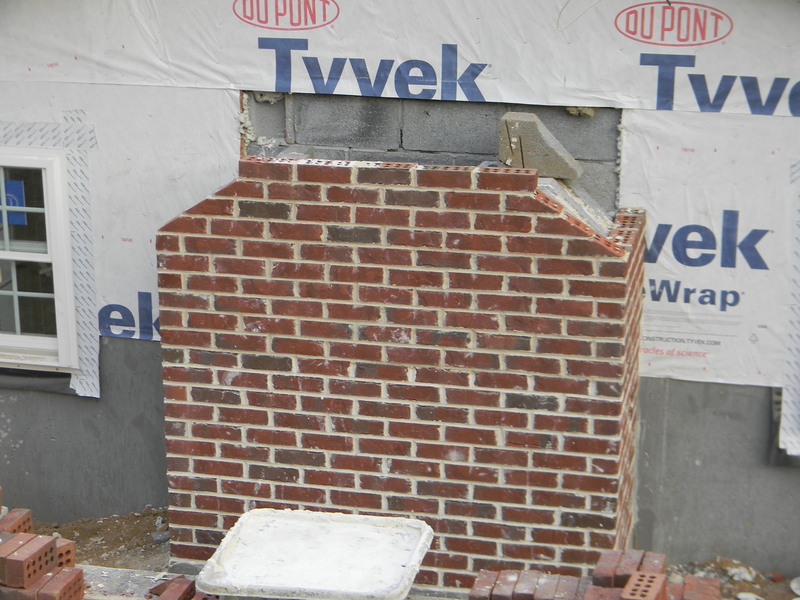 So we have a beautiful Rumford wood burning fireplace in the new addition with an amazing brick chimney and a fieldstone cap. It’s lovely. And then John asked what we wanted to do about the old fireplace. Should we resurface the wall and pretend that there is nothing there? Or did we want to punch out the cinder blocks to see what lurked behind? Was there ever really a question? What lurked behind was about 2 feet of ash and a really dirty fireplace box with an opening that was about 4 ft x 4 ft. I decided since it was authentic to the house, I wanted to leave it open – even if just to lay some logs in it and “pretend” that it was ready to light. 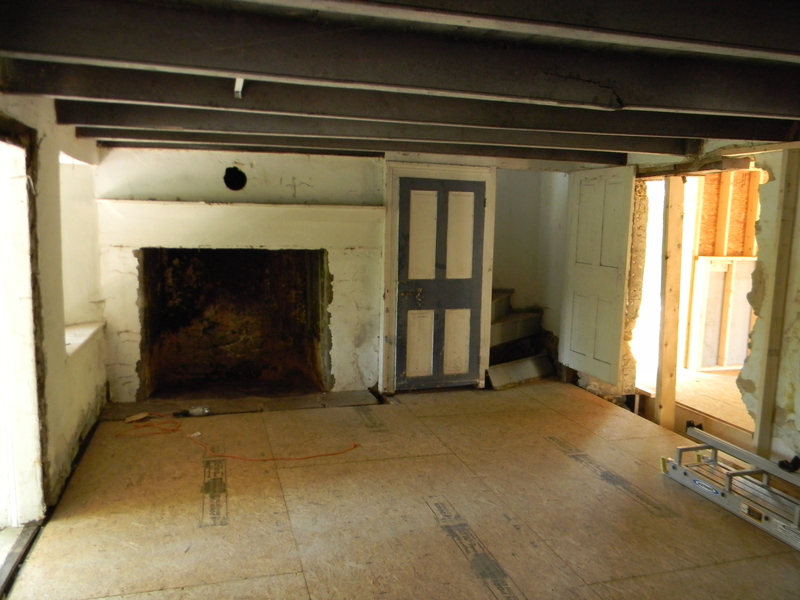 John consulted a fireplace restoration expert and came back with a proposal. The 163-year-old structure wasn’t in such bad shape after all, and at a price (a hefty price), we could still open it up and make it functional. 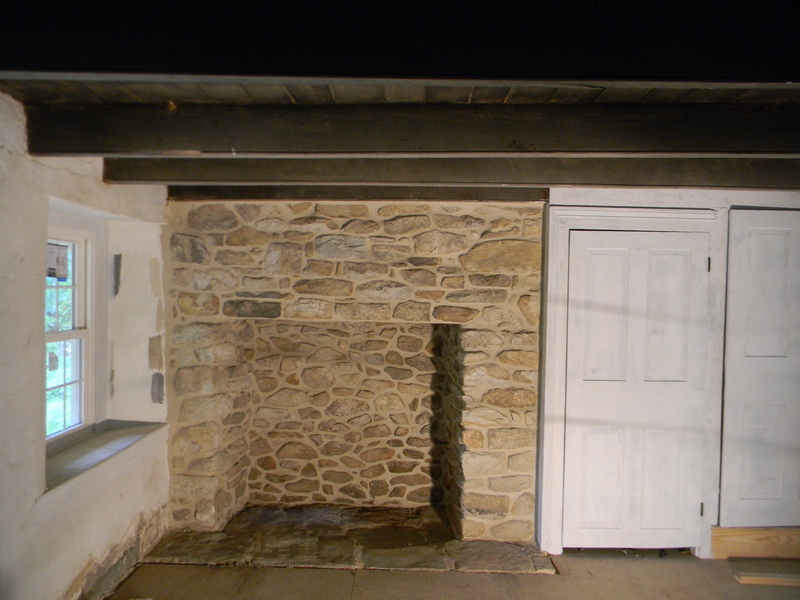 Since a hearth is the “heart” of a home, (or maybe a kitchen is the heart of the home – but this hearth is in the kitchen) – it just seemed that the heart of this house needed to be fixed. We said yes, but always with an eye on containing costs. I suggested that they just leave the “patina” (yes, I know it’s the accumulated dirt, ash, and creosote – whatever) on the inside of the fireplace – maybe it wouldn’t cost quite so much. And besides, if we were going to light a real fire in it – it would just get dirty again. John just nodded, as he frequently does when I have half-baked ideas. The construction started. There were tarps all over the place while they cleaned out the ash and soot, uncapped the chimney in the attic and punched a hole through the roof. The stucco was dreary but I figured a fresh coat of paint and a mantle would return it to it’s mid 19th century charm. Arianna and I pondered which chimney Santa would use this year and debated the strengths and weaknesses of each. One was clearly cleaner, one was significantly larger. I’m not sure she really cared which fireplace he will choose, as long as he chooses one of them. Then I walked in and saw our fireplace; the piece de resistance of this house – the one that Santa most definitely will use this Christmas. They had sandblasted the stucco, cleaned away those years of “patina” and revealed what lurked behind those cinder blocks. 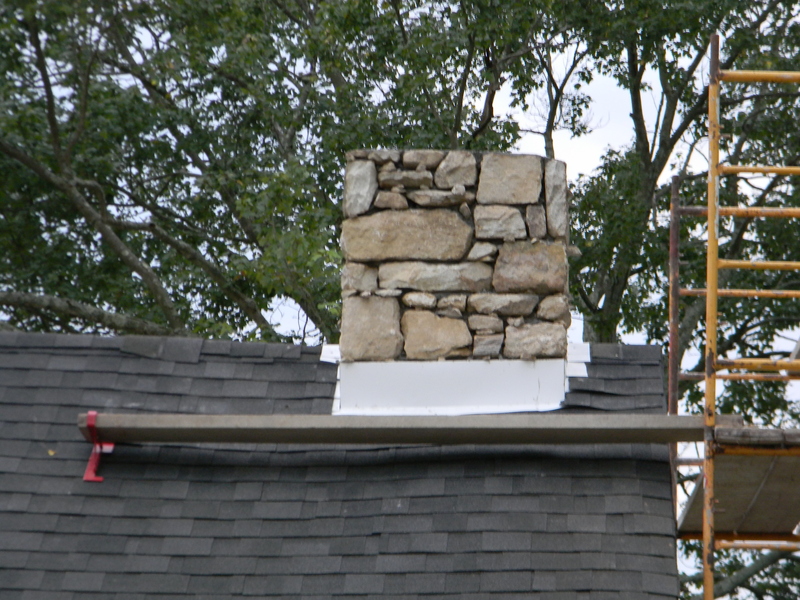 The top of the chimney with a fieldstone cap. The old fireplace — it’s too special to close it back up. 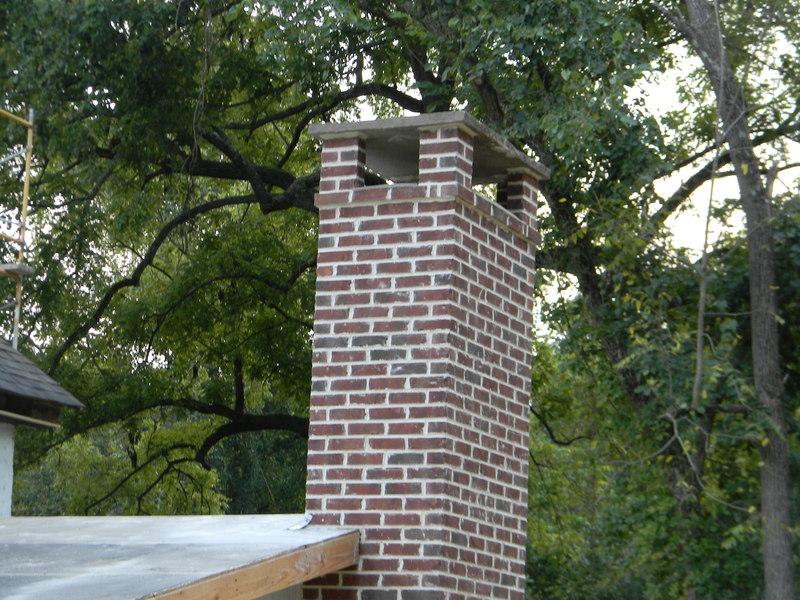 Now this is a chimney that Santa can fit in! 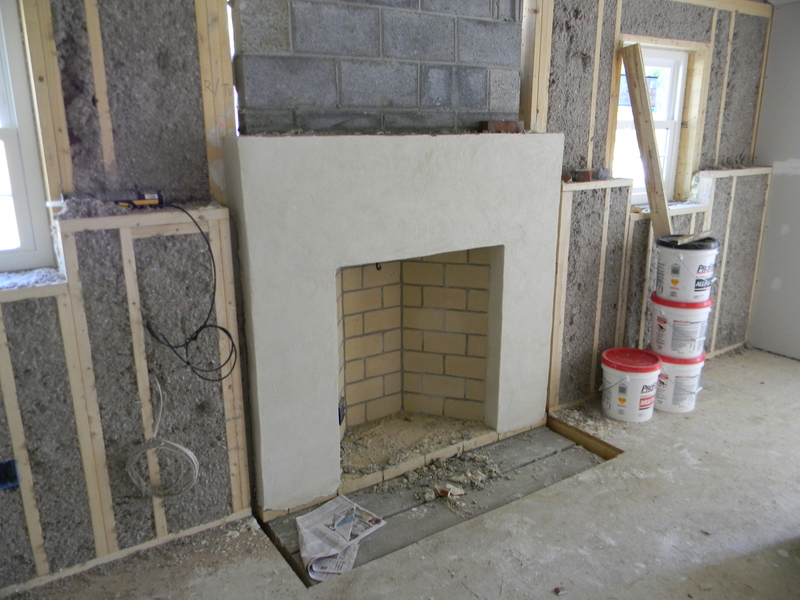 The kitchen fireplace revealed. This gem was hidden behind the cinder blocks. Santa will definitely fit here. Wow!!! Definitely “the Heart of the Home”!!! Awesome surprise! Wow! What a beautiful surprise! A def for Santa! What a beautiful fireplace! There is no question; that is where you should hang your stockings with care. What an awesome fireplace and awesome home! So happy for you both! What great hidden treasures you are finding! I enjoy reading your updates. Thanks! It is amazing! And to think it was hidden.